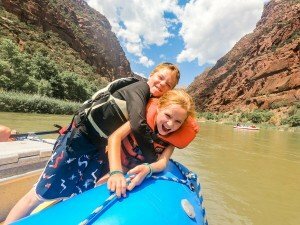 So you want to take your kids on a multi-day whitewater rafting trip? Congratulations, you are now officially one of the coolest parents ever!! 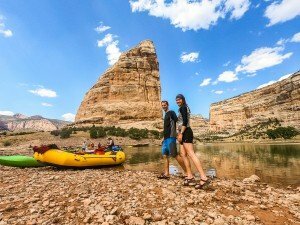 We recently returned from spending 4 days floating the Gates of Lodore section of the Green River through Dinosaur Monument in Utah and Colorado. Honestly, most people don’t even know this place exists. It’s the perfect example of a hidden gem. 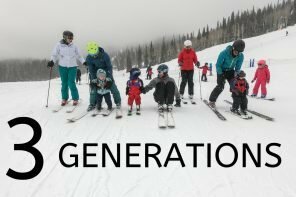 The best part about this trip was that we got to take our 8 and 11-year-old along with us! 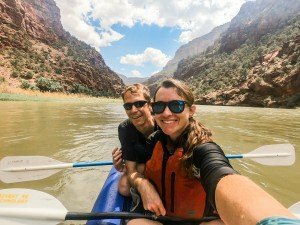 Honestly, even though we spent the last year traveling all over the world, this was one of our top trips EVER! When we were heading into our biggest rapid “Hells Half Mile” our 8-year-old daughter was so scared she was on the verge of tears. There was a point that I didn’t think she could do it and suggested that she and I get out and walk around this section. But she stuck with it, and about halfway through the rapid, she came alive. Her fear was replaced with excitement and she started yelling and screaming in triumph at the top of her squeaky little voice. She was grinning from ear to ear at the end of it and going through that rapid was the #1 highlight of her trip. And the best part was, that since we did it together, she wants to talk about it with me over and over again as she relives it all in her mind. It was an awesome experience, but the bond that it created was the best part of it all. 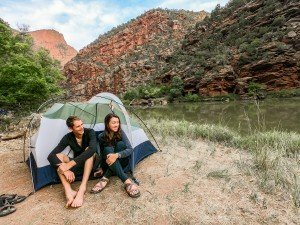 Don’t expect to get any sort of cell signal anytime in the canyons, so just plan right now that you’re going to be totally off the grid. In fact, if you value your electronics at all, leave them behind. As my kids were packing for our trip, my daughter threw her beloved Kindle into her pile, and her brother quickly showed her the error of her ways. You see, a few years ago, he had been on a rafting trip where the boat had flipped (you can read it all here) and his dry bag stayed underwater for quite a while as they got things fixed. When they got to camp that night, he realized that his dry bag was actually a “not quite as wet” bag as he unloaded all his damp clothes! Let’s just say, that by the time he finished telling her this, her Kindle quickly got removed from her bag! For us, we’ve found that our GoPro is invaluable on trips like this, so when it comes to electronics, that’s about all we take. We go on family vacations because we want to spend time together, right?!? 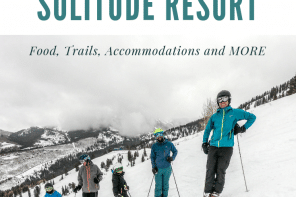 So then why are so many holidays designed to pull us apart – I mean between the kids club, the teen scene, and the expectation that work can always reach you, it can still be hard to connect with each other. Well, not on the river. You’re together ALL. THE. TIME. All those silly, hard, scary, and exciting moments are experienced side by side. 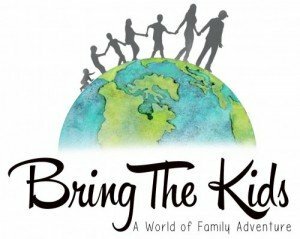 Want to get your kids to talk? Throw them on a raft with you for 5 hours. Here, it’s like the icing on the cake because there’s plenty of adventure topics to get those great conversations started and flowing smoothly! I think one of the true tests of the success of a family vacation is how much the kids tell their friends about it. Well, for us, this was a HUGE WIN. Join in a backflip contest off the back of the boat. Hold a dance party on the beach. Join in an epic water fight. Stay up late around the campfire swapping stories. Not only will you have a blast doing all these things, but you’ll suddenly be more relatable to your kids and your “cool factor” will increase significantly. 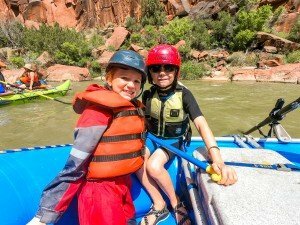 I know – did I actually just refer to a whitewater river as safe for kids? Well hear me out. Even though this stretch of river is mostly class III (with one IV), the location of the rapids makes it much safer than many other stretches of river. That is because after every rapid, you have a pretty long calm stretch, which is vital in case there are any problems. If someone falls out, you have plenty of time to get them back in and even if a boat flips you can get things fixed before the next rapid. On a lot of other rivers, the rapids are pretty continuous, so if someone falls out in one rapid, there’s a good chance they could swim through the next rapid too before someone can rescue them. As a mom (and former river guide), this is one of the extremely unique things about the Gates of Lodore section of river. 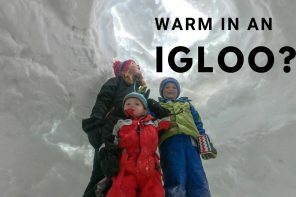 It’s so safe in fact that even though we took our 8 and 11-year-old, I would have been totally comfortable taking our 6-year-old as well. 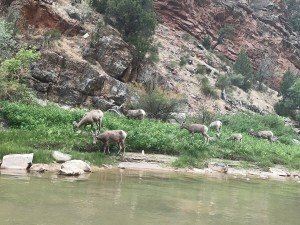 I saw more wildlife on this trip than on any other river trip that I’d ever been on. We saw beavers, foxes, big horn sheep, deer, eagles, osprey, and even a moose. This was great because it kept everyone on their toes and we all had our eyes peeled for what we would spot next! I don’t care if you’re a scientist or not, a trip through this canyon is bound to flood your mind with all your previous geology lessons as it all suddenly comes to life in front of you. See the layers of time literally waiting right in front of you. See how arches, oxbow lakes, and twisting canyons all came to be. Watch as you float over fault lines where entire mountains twist and fold hundreds or feet high. It’s truly stunning. My one regret is that I didn’t have my kids study geography more before we came because they would have learned SO MUCH here. Forget what you saw on your last visit to a big city, this is where you’ll find the best nightlife. Most days on the river end by late afternoon, leaving you plenty of time to explore, swim or just lounge in a hammock. Endless games of beach volleyball are waiting to be had and lizards and toads come out as the canyon starts to cool down. As you hang out by the campfire, the bats come out to signal that the greatest show on earth is about to begin. No, the circus has nothing on this – it’s all about the stars. I’m talking stars like you’ve never seen before. So many that I literally could not identify any constellations because there were too many stars. Because of how remote Dinosaur National Monument is, there is essentially no light pollution, so it’s ideal conditions for stargazing. In fact, if there is no rain in the forecast, just throw out your sleeping bag on the beach and fall asleep right there. We did, and it was one of our kids favorite things about the trip! I don’t even feel like I can adequately describe the scenery. It’s just jaw dropping. Huge canyons, sandstone cliffs, petroglyphs, animals. Throw on top the quiet evenings and the calm and cool mornings and I’m pretty much in heaven in Dinosaur! There are two ways to run this stretch of river. The most popular (and easiest) option is to go with a commercial company. 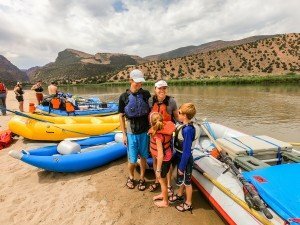 Visit Dinosaurland is a great resource here for this and they have several local companies that they recommend rafting with. On most commercial trips, your guides will do all the “work” like cooking, clean up, and rowing, in addition to giving you all your supplies. Unless you have pretty extensive rafting experience, this is the way to go. 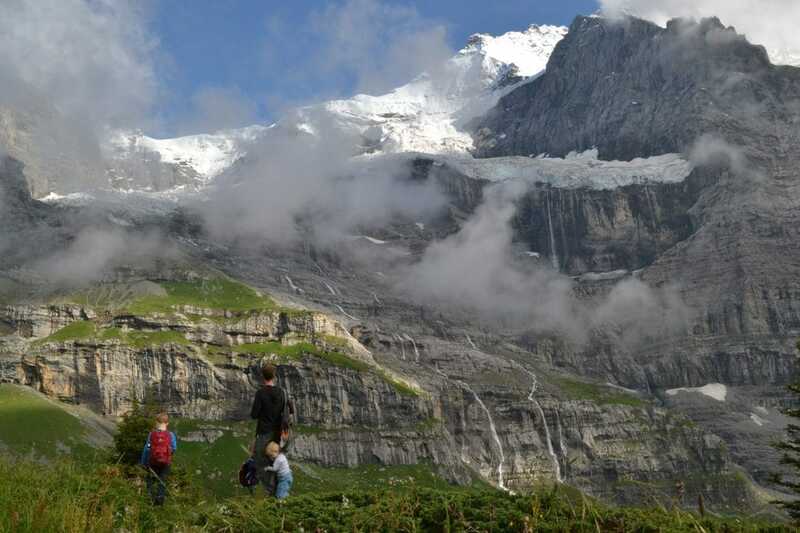 For us, we opted to do it on our own, by getting a permit from the parks service (info here). 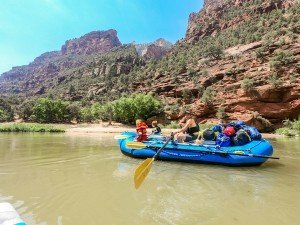 We took 5 rafts, 2 inflatable kayaks, and 1 hardshell kayak for our group of 23 people. 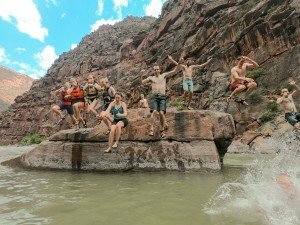 All of us are friends and family and 11 of us have extensive river guiding experience (I worked as a whitewater guide through college). 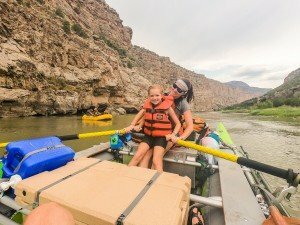 Honestly the amount of gear that it takes to do one of these trips is pretty extensive, but after being raised in a family who have been pretty serious about rafting for the last 25 years, we have no shortage of gear. The river rangers are also a great resource and have loads of information here, and are available on the phone as well. Depending on the time of year you go, you will find different conditions. Typically, the river is faster and the waves are bigger from late May- June and smaller other times. 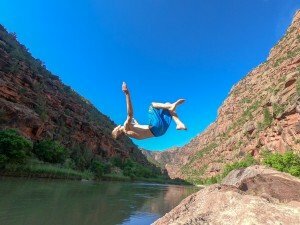 When we ran the river this year, it was the end of July and the river was running at 2500 cfs. Honestly, I felt like it was a perfect level for families because it was exciting and adventurous, but it didn’t feel super scary. 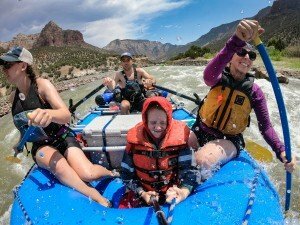 I’ve also run it in June at 4000 cfs (without kids, 2 years ago) and the rapids had a different feel to them. 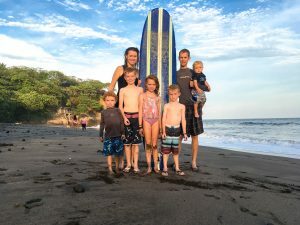 At that level, I would have been comfortable with the kids we took, but would have been more cautious, and I wouldn’t have been comfortable taking any kids younger than age 8. For us, we rarely visit the same place twice (there are too many places we want to see for that), but this is a trip that I can see us doing over and over again. I mean, after all, we have 3 more kids who still need to experience the magic of the Gates of Lodore! Special thanks to Visit Dinosaurland for partnering with us to share this trip with you. Really its enjoying to see people having fun at gates of lodore. I just lived all the fun through your blog. Thanks for sharing such a wonderful experience. 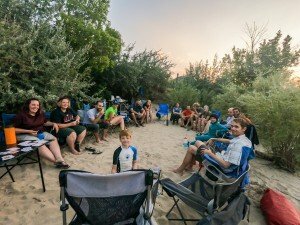 We went down a quiet river with kids this summer for the first time and I thought it was one of the best activities you can do with your young ones. You get to see miles of different sceneries without too much effort on their part. It was pouring rain almost the whole time and everyone still remain in good spirits!